This Pedometer consists of a mikromedia for STM32-M4, a mikromedia Proto shield and LiPo battery. Let's measure how far you walked with this Let's make. A pedometer is a portable device that counts each step a person takes. The touchscreen displays number of steps and duration of walking. Message “no movement” is written when there is no movement. Also, the interface has START and STOP button. Algorithm samples the accelerometer data every 0.5 seconds as you walk, and dynamically adapts the threshold. If you need a battery power supply, we have a great and compact solution. This rechargeable 2000mAh 3.7V battery can deliver even more. Smart programmable touch 2.8'' display, packed with features. Mikromedia can be used for controlling a wide range of applications: from simple hobby projects, up to entire machine installations. 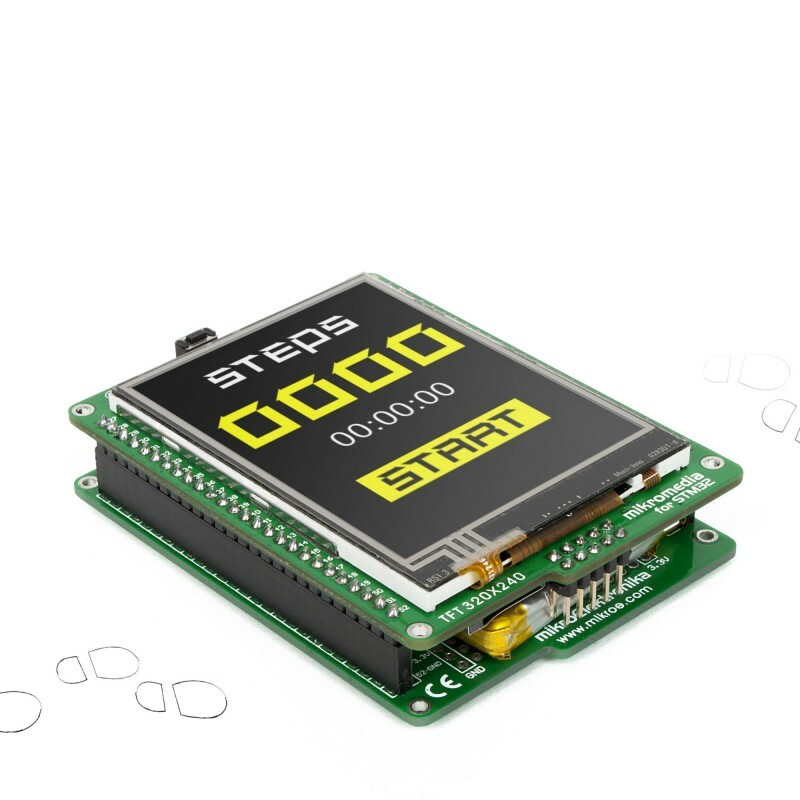 It is powered by STM32F407VGT6 microcontroller unit, it gives you true power to build GUI-centric embedded applications.